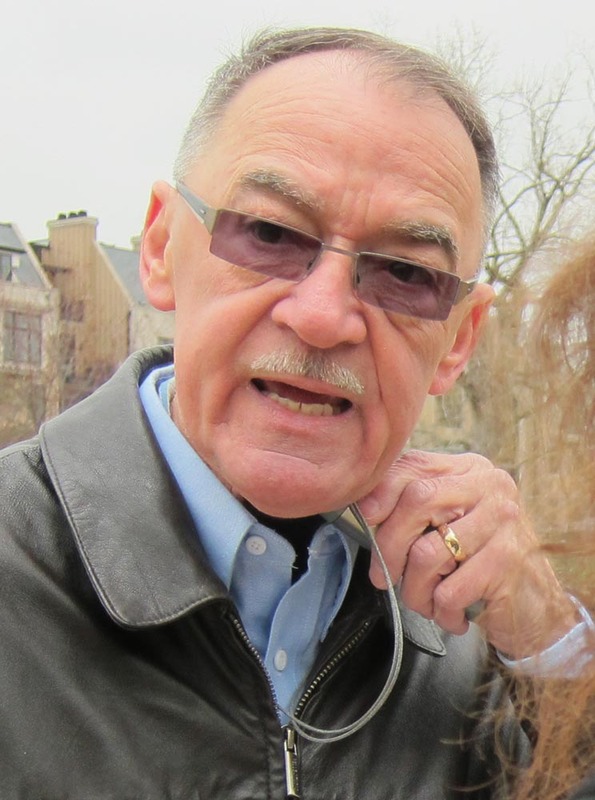 CLAYTON • Puffing on cigars, and with cameras rolling, W. Bevis Schock and Hugh A. Eastwood last week handed out copies of their lawsuit challenging Clayton’s ban in parks and other outdoor places. They stood – legally – on the sidewalk just outside Shaw Park. 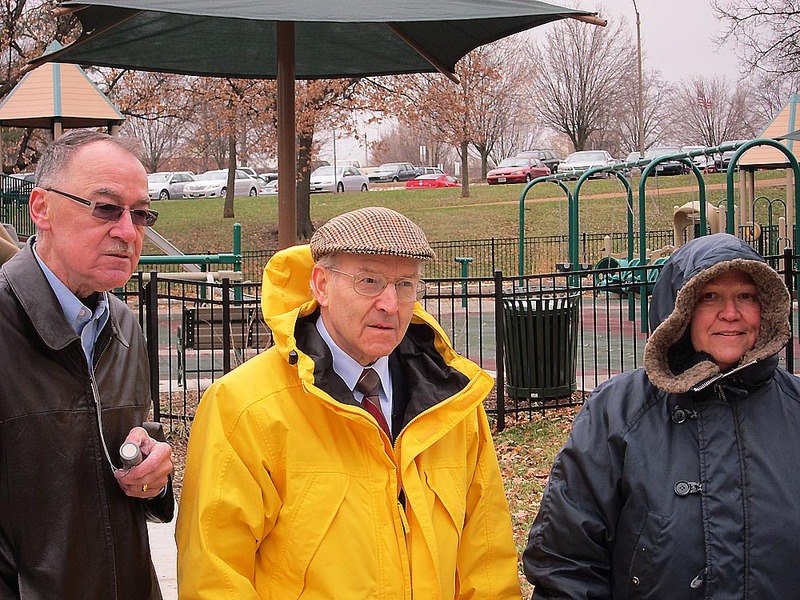 This week, Martin Pion and friends from his organization, Missouri GASP (Group Against Smoking Pollution) held a news conference near the new inclusion playground inside the park – but on the other side of the park. They handed out literature sharply criticizing the suit. He said that second-hand smoke — indoors or outdoors — endangered health and caused diseases. With him were Don and Kay Young, whose non-profit group Young Choices Inc. visits schools to talk about the dangers of smoking. Also there was Vivian Dietemann, who has asthma and is highly smoke-sensitive. Young described his bouts with throat cancer and severe cardiovascular disease. Because of operations to save his life from cancer, he can no longer speak on his own. He speaks through an electro-larynx in what he calls “robot-like” speech. The suit argues that the ban denies Gallagher his constitutional rights. In specific, it cites the 14th Amendment’s due process and equal protection clauses. Dietemann said that many courts have said that smoking is not a “fundamental right.” The suit claims it is a “fundamental right” that is “part and parcel of ancient American history, traditions and customs,” including American Indian peace pipes. The suit names as defendants the city of Clayton and Mayor Linda Goldstein, City Manager Craig Owens, Parks Director Patty DeForrest and Police Chief Thomas J. Byrne. Nearly 500 communities around the U.S. have banned smoking in public parks. The Clayton community in surveys has strongly endorsed a smoking ban, including in outdoor places. Clayton enacted an indoor ban on July 1. The outdoor ordinance, which became effective Jan. 1, bars lighting up in parks, on playgrounds and all other city-owned or leased facilities. That includes city-owned parking garages and lots. The law allows smoking on sidewalks, streets and in alleys. 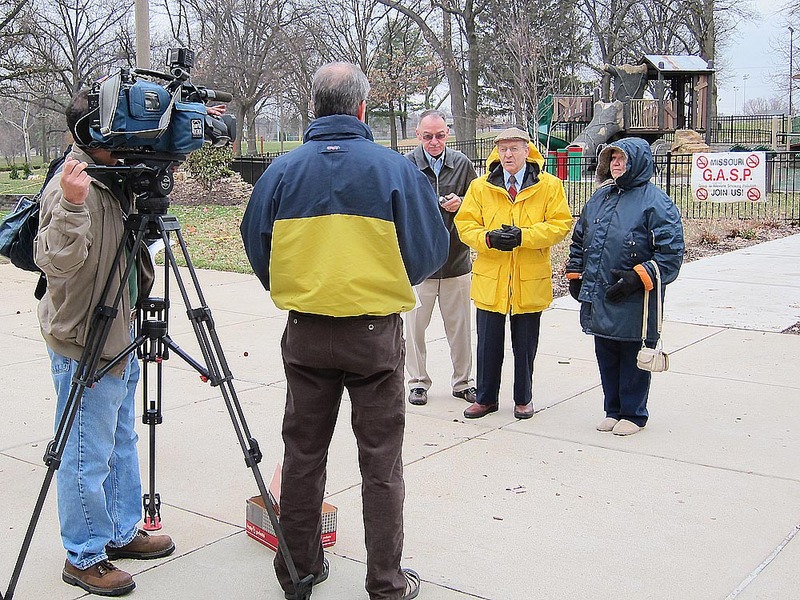 (L to R facing camera) Don Young, Martin Pion, and Vivian Dietemann during KMOV Channel 4 TV interview. The Inclusion Playground - designed for use by all children, including those with disabilities - with a MoGASP banner on the railings, is behind them. I absolutely agree that smoking should be done on private property with consenting adults. A bar is private property which only hires and serves adults. Each business owner should decide whether he/she wishes to allow the use of a legal product on their property, and should post such notice at each entrance. All employees know, when they walk in to apply for work, if it is a smoking allowed place or not. They make the choice. The owner did not drag them in and force them to work. If the “pro ban” people were lobbying to ban the selling of all tobacco products, I would support them. They do not do that and they never will. I find this demonizing of people revolting. It is the Government that wants people buying tobacco, NOT bar owners. Well done …My fellow friends..The right to breathe has more right than smoking…Smoking is not a right..